John Zorn is well on the way to becoming the most prolific artist in music history. Through recordings from Painkiller, Naked City, Masada, and untold other projects, the man is associated either through composing music for or performing on an average of over ten albums per year. For those unfamiliar, his Masada project was arguably his most well known and commercially accessible. A mixture of traditional Jewish-inspired-klezmer infused with Ornette Coleman, Masada: Book One was primarily written for the performance of his own Masada Quartet, consisting of himself on saxophone, Dave Douglas on trumpet, Greg Cohen on bass, and Joey Baron on percussion. Masada: Book One consisted of well over a hundred compositions, each revolving around the central Judaic theme but magnificently varied in their style and execution. A little over three years ago, Zorn put pen to paper once again, providing three-hundred or so new compositions for Masada: Book Two or the Book of Angels. Zorn proved to be more generous with this batch  outsourcing the bulk of them to various artists through familiar branches on the Zorn family tree such as Jamie Saft and Marc Ribot. 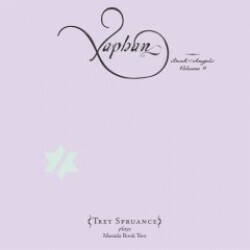 Zorn has worked with many of the past and present members of Secret Chiefs 3, Trey Spruance, Eyvind Kang, and Trevor Dunn to name a few, but Volume 9 or Xaphan is the first complete Secret Chiefs 3 recording released on the Tzadik label and is one of those rare anticipated collaborations that lives up to expectations. Secret Chiefs 3 bring their special blend of eastern influence and esoteric eccentricities to the arrangements along with an unexpected bonus. Known for their clockwork precision, the band presented here sounds like a band at last at ease  relaxed, like theyre almost having (dare I say it) fun. At the risk of sounding facetious, Spruance, the undisputed leader of all things Secret Chiefs 3 isnt exactly known for his easy-going nature. He is, in the parlance, a serious artist. This description would be given with a certain amount of disdain and sarcasm if the guy wasnt so goddamn talented. Like his previous Mr. Bungle bandmate Mike Patton (shut up, you knew Id be dropping that name before this review was finished), Spruance is a noted perfectionist and as such, surrounds himself with great musicians he can count on to deliver the goods. This will always be a good thing and with Xaphan showcasing the likes of Tim Smolens and Ches Smith, you can pretty much guarantee an album of substance, worth, and beauty that has become a cornerstone of both Zorn and Spruances work throughout their career. Posted July 23, 2008, 11:12 p.m.